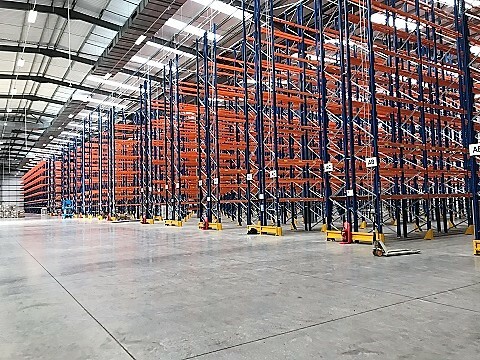 Warehouse Storage Solutions are one of the UK’s leading providers of high quality specialist, quality pallet racking solutions to customers in the Telford & Market Drayton areas. Telford & Market Drayton are strategically in the heart of the UK close to the M6, M5, M54 and M42 motorways in the busy north Midlands in the county of Shropshire. Telford & Market Drayton have good inter-connected transport and distribution links and access to the motorway network makes it a great area for distribution and logistics specialists. There comes a time for many companies when consideration has to be given to whether to decide whether to relocate or to extend the existing premises. The build or relocate options are very costly and almost always cause enormous disruption to the normal day to day activities of the business. Should you consider getting better use of your existing footprint rather than build or re locate? An innovative pallet racking solution gives you the added benefit of saving money and at the same time reducing potential disruption. At Warehouse Storage Solutions our customer portfolio is very expansive in both the public and private sector with a have a wide range of customers from small independent businesses through to major global corporations. Our extensive network of sales agents and engineers covers the Telford & Market Drayton area which enables us to be very responsive to customer enquiries & requests for quotations. We offer no obligation quotations & always ensure you get the most suitable & cost-effective pallet racking solution possible. For added peace of mind we are able to take the lead in the project management from end to end to ensure on time delivery and within agreed budgets. Most of new customer enquiries come to us via referrals from existing clients. As each project is individually tailored in order to meet your exacting requirements, you get the best possible. Pallets move on inclined rollers. Pallets move through gravity without the need for human or mechanical intervention. If stock rotation is critical, live pallet Racking is the one to choose. Fork lift trucks are able to enter the storage lane making the most out floor space and the available height. Superb option for outdoor storage. Galvanised metal makes it weather proof. We offer no obligation quotations and are highly responsive, so if you are in or near Coventry Kenilworth & Warwick areas give Warehouse Storage Solutions a call.